GREENFIELD—As the father of an 18-month-old daughter, Scott Seibert has great hopes for her future and her faith. “I want her to join the convent,” Seibert says with a laugh, showing the protective nature that most dads of daughters share. Scott and his wife, Katherine “KC” Seibert, also had great hopes for becoming active members of a Catholic parish after they were married in the Church four years ago. It was the kind of situation that might have led the young married Catholic couple to wonder if they were welcome in the Church. Yet instead of quietly slipping away, the Seiberts pursued an approach that is becoming a trend in some Catholic parishes across the archdiocese. Figuring that “parishes have a million things to do and people are so busy,” the Seiberts took the initiative to start their own outreach and their own programs for young adult Catholics at St. Michael Parish in Greenfield. “I e-mailed Deacon Wayne Davis at the parish about wanting to get more involved,” Scott says. “I started teaching RCIA [Rite of Christian Initiation for Adults.] Then he introduced us to Chris and Mary Meek. They felt like we did, so we formed a small group. We felt we had to do something to make young adults feel welcome. The Seiberts started game nights at their home, playing Catch Phrase and Apples to Apples. They added movie nights, serving pizza, too. This summer, they have met twice a month to pray the rosary, followed by a get-together for fun and conversation at a frozen yogurt shop. Each time, they kept inviting someone new. The group has grown to 15 people. Besides providing a social connection, the group also established a faith bond. It also ties into one of the challenges that the Church faces in the 21st century. Sherry Weddell discusses that challenge in her 2012 book, Forming Intentional Disciples: The Path to Knowing and Following Jesus. Part of her book focuses on statistics regarding Mass attendance by young adult Catholics—statistics taken from the 2007 survey “Marriage in the Catholic Church” by the Center for Applied Research in the Apostolate at Georgetown University. Among Catholics in the age group from 26 to 46, the survey noted that 13 percent attend weekly Sunday Mass. In the age group from 18 to 25, 10 percent attend weekly Sunday Mass. John Aikin has seen the need for that intentional approach as one of the leaders of Richmond’s young adult Catholic group for the parishes of Holy Family, St. Andrew and St. Mary. “Young adult outreach in the Richmond Catholic Community is a very important and necessary ministry for the growth and unification of our parishes,” says Aikin, 27, a member of Holy Family Parish. “The 20-40 age group is a very critical one. We see people at this stage in life falling away from the Church more than any other stage in life. Hoping to address those three areas, the young adult group in the Richmond Catholic Community has tried different approaches, including Theology on Tap events that take place in a relaxed atmosphere such as a restaurant or bar. Archbishop Joseph W. Tobin spoke at one of the get-togethers this summer. “It’s a wonderful way to join in fellowship with young adults who do not necessarily know each other, build relationships with new and old friends, discuss our faith in a very open manner, and grow as a small community,” Aikin says. “It’s really important for us as young adults to build that connection. 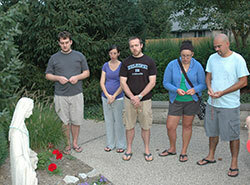 Groups for young Catholic men and young Catholic women have also been established. Such efforts in the Richmond Catholic Community, St. Michael Parish in Greenfield and other parishes across the archdiocese are still in their infancy. Many challenges await, but the commitment is strong. She’s seen the impact of sharing that faith with other young adult Catholics. Aikin remembers his faith life before he and his wife, Shannon, became involved in a young adult Catholic group. “I would go to Mass with my family and see five or six other families at the exact stage of life that I’m in, and have no clue who they were, but I knew there was such a possibility for connecting on so many levels,” he says. “Odds are those same struggles and joys my family may be experiencing, their family could be experiencing as well. As those relationships continue to grow, so does the faith of the Aikin family, says Shannon. She and John have a 3-year-old daughter, a 2-year-old son and a child due in September. “It’s a very powerful feeling to know that there are women in the same position as I am, struggling with similar things while trying to achieve the same goals in their efforts with raising a family and sustaining their marriage,” says Shannon, who is 28.